One of New York's Bravest is objecting to the use of his likeness in a poster marketing the services of a New York law firm that specializes in 9/11-related illnesses. The ad in question features a firefighter holding a photo of the devastated World Trade Center site, accompanied by the words, "I was there. 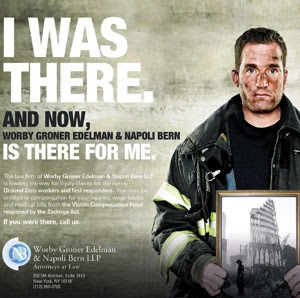 And now, Worby Groner Edelman & Napoli Bern is there for me." And therein lies the issue: the man in the ad, Robert Keiley, didn't become a firefighter until 2004. According to the New York Post's Reuven Fenton and Jennifer Fermino, Keiley is particularly upset that the photo in the poster was manipulated from a generic promotional photo for the department--of Keiley holding his fire helmet. The law firm's ad agency, Barker/DZP, swapped a picture of the World Trade Center in place of the helmet. They then debuted the poster at a fundraiser, the World Police Fire Games Event Gala; a move Keiley thinks makes him look like a "scumbag." "It's an insult to the Fire Department. It's an insult to all the families who lost people that day," Keiley, an ex-cop who also works part-time as a model and actor, told the Post. "It makes me look like I'm cashing in on 9/11, saying I was there even though I was never there, and that I'm sick and possibly suing, trying to get a chunk of money." The ad sparked the ire of popular anonymous advertising blogger Copyranter, who expressed to us that the ad reinforced his long-held belief that "law firms shouldn't advertise" because it's "unethical, and they just plain don't know how."